I picked this stuff up at rexall because it was on sale. I don't know why I did because I wasn't looking for hair products and I hadn't ever been interested in dove before but OH MY GOD. SO GOOD. I used it after aphogees two step repair thing and left it in over night. Its such an amazing conditioner! So creamy and moisturizing! This is the best conditioner I've come across lately and I'm so happy to have found it! 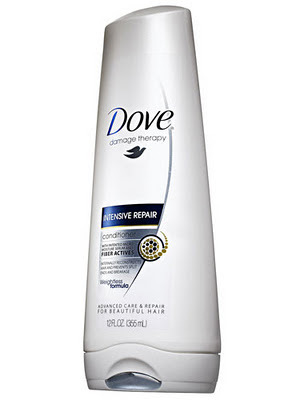 You damaged/dry/frizz babes need to try it out asap! If your hesitant look for it on sale. Use this with a sulfate free shampoo (my fav being the Moroccan oil one) and your hair should LOVE you. How is it? I never tried this one!